What is the RAND Function? 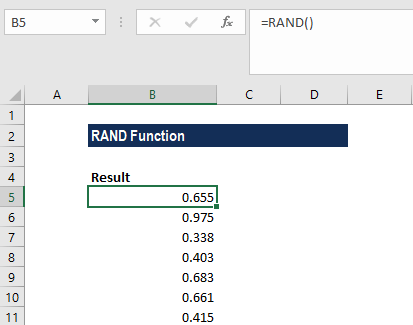 The RAND function is categorized under Math and Trigonometry functionsFunctionsList of the most important Excel functions for financial analysts. This cheat sheet covers 100s of functions that are critical to know as an Excel analyst. The function will return a random number between 0 and 1. It will provide a real number that will be returned every time the worksheet is opened. As a financial analystFinancial Analyst Job DescriptionSee a real Financial Analyst Job Description including all the skills, experience, and education required to be the successful candidate for the job. Perform financial forecasting, reporting, and operational metrics tracking, analyze financial data, create financial models, the RAND function can be used to generate random numbers. However, it is used less frequently in the finance industry, compared to other fields such as cryptography and statistics. The RAND function requires no argument. RAND will calculate a new value each time the worksheet is calculated. If we wish to stop random numbers from being updated, we need to copy the cells that contain RAND to the clipboard and then use Paste Special > Values to convert them to text. If we wish to get a random number that will not change when the worksheet is calculated, we need to enter =RAND() in the Formula bar and then press F9 to convert the formula into its result. If we wish to generate a set of random numbers in multiple cells, we need to select the cells, enter RAND() and then press Ctrl + Enter. If we wish to generate a random number between two numbers, we can use the formula: RAND() * (b – a) + a, where a is the smallest number and b is the largest number that we wish to generate a random number for.